I get '403 Forbidden' when trying to access the screenshot. And what's the font? It renders great on the bar. 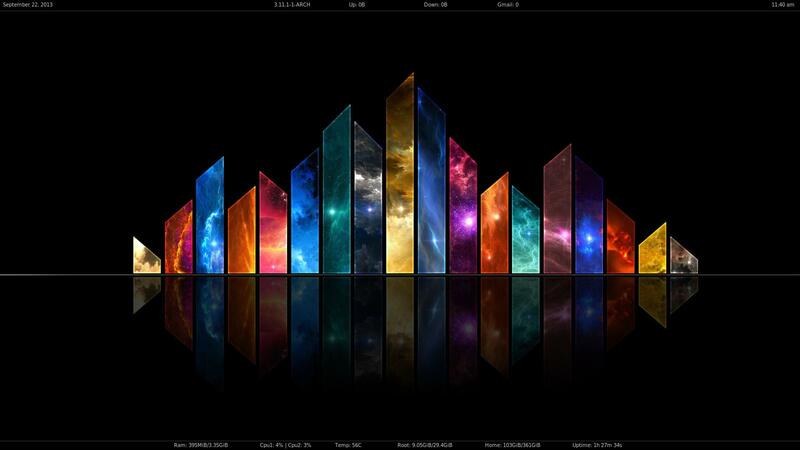 First time Bspwm user, haven't gotten into getting bar to work or anything, so am using conky for now. 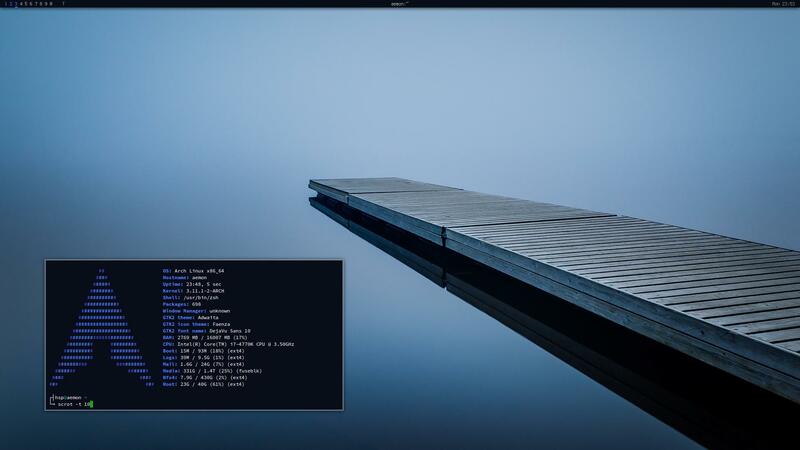 Was using openbox before this, and I have to say that I was looking for a tiling window manager for a long time and am so glad that I found this one. This was ripped from stuff posted by Milomouse, and Neuromatic with minor changes to suit my taste. Thanks. Note: Some of the syntax for bspc may have changed in recent versions of bspwm, but I'm not on that version yet. Can you share the wall? And, I like the font, but it's too small for me, can you suggest a similar one, but a little bigger? where is find pragmata font ? Try searching on Github, maybe here: https://github.com/vigsterkr/circos/blo … agmata.ttf? EDIT: I didn't realize the packaged was broken. My bad. Hi, it's my first post and first share. I was using awesome untill yesterday. I decided to give bspwm a try. Here are my results for today. 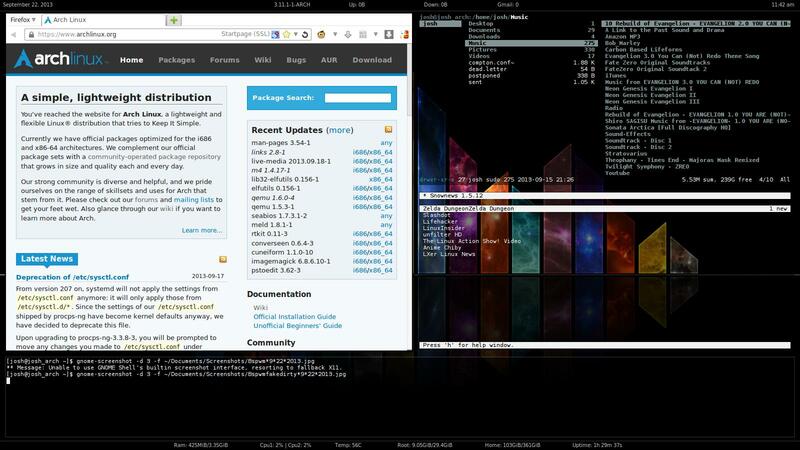 dzen2 + conky for the panel. Got bored of my old font and color scheme, so I'm now using Source Code Pro and a very slightly modified version of one of jasonwryan's color schemes. I'm pretty sure your font isn't being rendered correctly because I'm using source code pro. ^I can't seem to get xft fonts to render properly in urxvt. What terminal emulator are you two using, or what did you do to get those fonts to render nicely? I cannot speak for Hpasta, but I have been using termite-git from the AUR lately, and it is quite nice. The fonts render beautifully using xft, it is 256-color capable, and has some other neat features, like the ability to set a browser (or use $BROWSER) to follow links. That is, if there is a link, I just use ctrl+shift+x and it gives me numbered hints like pentadactly or dwb or luakit or etc. I'm using termite, the same one WonderWoofy mentioned. Do you still have script for you bar, would like to look at it so I can make my own. I noticed that my scripts for dzen2 panels look different than most here. Can someone check them? Because I don't really see any reason for using functions there. Also changed font from Terminus to Fira Mono. Looks nice.